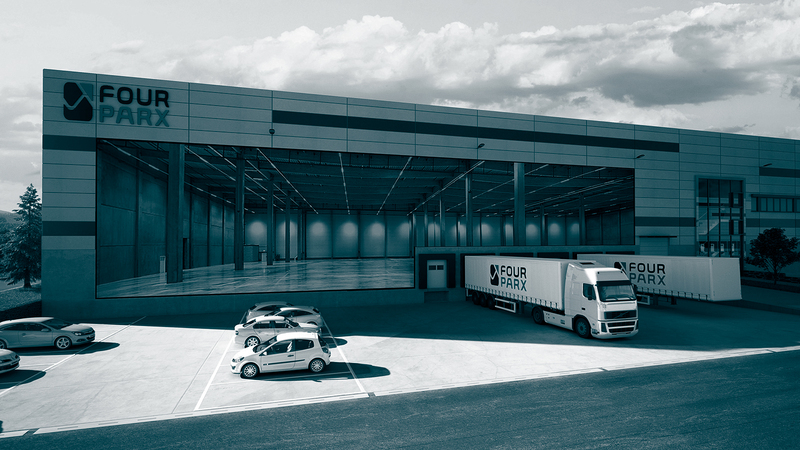 A new state-of-the-art commercial and logistics property with 30,000 sqm of usable space is currently being developed by FOUR PARX in the Dahlewitz industrial park. The rental spaces can be subdivided flexibly into units starting at 2,500 sqm. The property is especially marked by its central location, custom divisibility and the flexible combinability of the units. Thanks to the sustainable construction method in accordance with the gold standard of the German Sustainable Building Council (DGNB), as well as the high level of building insulation, temperatures automatically fall during the summer and heating costs decrease during the winter. A partner project between Taurus Investment Holding GmbH and FOUR PARX. Investment by DEKA. The industrial park has a direct view of the BAB 10, Berlin’s circumferential highway. 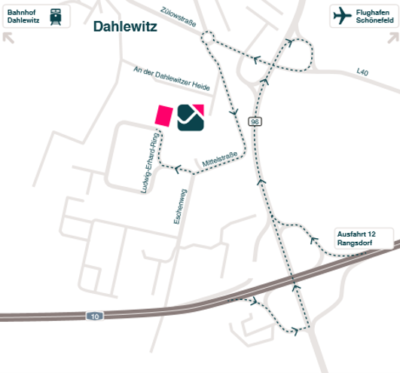 The center of Dahlewitz can be reached within 3 minutes by car. Dahlewitz railway station can be reached within 4 minutes by car. The closest hotel and restaurant can be reached within 5 minutes by foot. A Rolls-Royce administrative hub and a test center, as well as a Raab Karcher building materials store, are located within immediate vicinity to the object. The distance to Berlin Schönefeld Airport is ca. 16 km. Countless local supply stores are close-by. The Regional-Express train to Berlin and other destinations has a direct stop in Dahlewitz. Our FOUR PARX GLOBAL property type is divided into 2 segments. Segment 1 has an overall floor space of 10,000 sqm with up to four rental units of 2,500 sqm each. Segment 2 has two rental units of 2,500 sqm each. Both units can be combined into one floor space of 5,000 sqm. You can also combine segment 2 with segment 1 and combine them into one overall floor space of up to 15,000 sqm. Construction work conforms to the DGNB gold standard (German Sustainable Building Council).